Westerly is a town on the southwestern shoreline of Washington County, Rhode Island. First settled by Elder John Crandall in 1661 it is believed that John Crandall named the town after his birthplace in Westerleigh, England. Today Westerly has many references to his name. As of 2000, this community has a population of 22, 966 which covers 30.1 square miles of land and 44.7 square miles of water. Westerly has a friendly atmosphere. Visitors from all over enjoy the calm beaches and the unique shops that the downtown area has to offer. 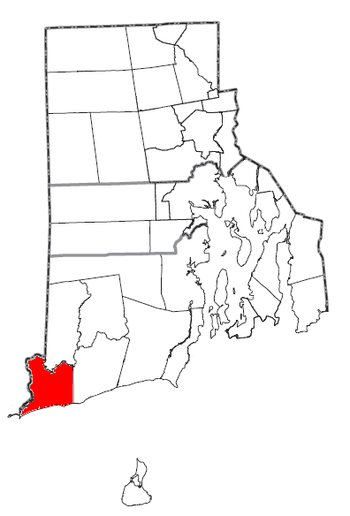 Westerly is a small town in the southern most portion of Rhode Island. The Pawcatuck River runs along the western boarder of the town where it serves a dividing mark between Westerly and Pawcatuck, Connecticut. Westerly's town crest originates from a species of Salmon that once resided in the Pawcatuck river. Along Atlantic Avenue their are several salt ponds, opposite the towns majestic beaches, that can be used for fishing and water sport (where permitted) This community doubles in size during the summer months due too the towns desirable beachfront that attract families from all over New England. Westerly is also known for its textiles and unique type of granite that is quarried from Bradford and Potter Hill regions of Westerly. Griswold Textile Print, Inc. has been family operated since 1937. This plant operates on the Pawcatuck River where they make all their prints in house. Westerly is known for its Italian influences. Long ago when many europeans sought to migrate to the United States, a large portion Italians decided to settle in what is now westerly. For a while the town was essentially all Italian and although today the town has diversified greatly, the influences of the past still remain. Westerly is famous for its restaurants with classic Italian foods such as soupy, pasta and pizza. However Westerly is not known exclusively for its food. Westerly's beaches are renowned across New England, tourists flock from all over to visit beaches such as Misquamicut State Beach and East Beach in Watch Hill. Watch Hill is a very upscale part of Westerly that also offers much to tourists such as food, drink, and shopping along the beach. Amtrak, 14 Railroad Av., +1 800 872 7245, . One of Rhode Island's three stations is in Westerly. Westerly State Airport (IATA: WST) (ICAO: KWST), 56 Airport Rd. Small regional airport designated for small aircraft. This airport is a main shuttle point for Block Island, RI. RIPTA FLEX Service . Transit designed to serve suburban and rural communities in Rhode Island. Reservation need to make with 48 hours in advance by calling the TOLL-FREE Flex Line at +1 877 906 FLEX (3539) or +1 401 784 9500, ext. 220. The easiest way to get around Westerly is by car, bike or even foot. Because of the size of Westerly a person can easily access a wide range of are by simply just walking around. However many people also choose to ride their bikes on Westerly’s many bike paths or even drive if going a longer distance. Although getting around is very easy parking can sometimes be complicated. During the summer months, parking becomes more limited and the fees increase. However during the winter and spring months parking is very easy and there are virtually no fees. The main parking areas for the winter and spring months are either downtown or one of Westerly’s schools or parks. However, during the summer months most of the people like to park down by the beaches for a fee. Granite Theatre, 1 Granite Street, +1 401 596 2341. 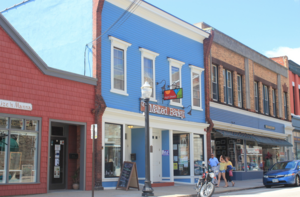 The Granite Theater occupies a historic building in downtown Westerly and offers Broadway productions from March through December. Shows are everyday of the week mainly from 2pm to 5pm and 6:30pm to 8pm. Prices range from $ 11 to $20 dollars depending on if its a comedy or musical. The Ocean House: Located right on the border of watch hill the recently renovated ocean house is a great place for tourists to walk around in. The ocean house offers a surplus of amazing views. It overlooks the Atlantic Ocean and at night it becomes a popular place for people to get together and socialize. 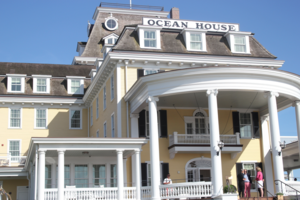 Also since it’s been recently renovated the Ocean house has become one of Westerly’s main attractions. Rotary Park: Rotary Park is a small park located right off of airport rd. It has a very small town feel to it as it is run by the town itself. Many people go here to take in the nice scenery. Many people even bring their bikes to use on the bike paths. Also, Rotary Park is located directly across from one of the runways at westerly’s airport so pedestrians are allowed to stand and watch planes land and take off from closer than ever before. Watch Hill: Watch Hill is a very upscale portion of westerly, located right on the water watch hill allows tourists of all kinds to take in the great beach scenery while they shop and talk with friends. Watch Hill also has its very own marina, boats of all kinds come in and out of here virtually all summer long and some even during the winter months. Wilcox Park. 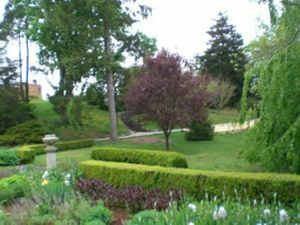 Features 18 acres of a wide variety of trees, flowers and shrubs. Wilcox Park is a Victorian-era walking park that has been the center of Westerly's historic downtown since the late 1800's. Recent renovations included replacement of all the concrete walkways and a complete remodel of the pond. The pond is the highlight of the park where docks and birds swim with ease. On the east side of the park there is a impressive World War Memorial dedicated to those who have fallen. This memorial is distinct with its granite and blue stone paving. During the midsummer season, Wilcox Park is the setting for the annual Summer Pops Concert, which draws nearly 20,000 of visitors from throughout the area. Watch Hill Boat Yard, 21 Pasadena Avenue, +1 401 348 8148, . This traditional boatyard and marina offers eighty one slips for boats of up to fifty feet in length, and twenty seven moorings for sailboats of up to forty feet in length. Babcock-Smith House Museum 124 Granite St, +1 401 596 5704. The Georgian Mansion (circa 1734) is the former home of the Babcocks and Smiths. The mansion is elegantly furnished with pieces reflecting the Colonial Babcock years, the Victorian Smith years, and colonial restoration of 1928. It is open May 30 through October 31: Saturdays 2:00-5:00 pm. Price: $5 Adults , $1 Children under 12. Duck Land & Water Tours The Greater Westerly Pawcatuck Chamber of Commerce, One Chamber Way, +1 401 596 7761 or +1 800 732 7636. Tours are half on land and half on water and a complete ride lasts for 60 to 70 minutes. You can enjoy historical sites and anecdotes while riding in the authentic, renovated World War II amphibious landing vehicle. The Knickerbocker Cafe, 35 Railroad Avenue (across the street and to the left of the train station), +1 401 596 4225 ([email protected]). This popular night life attraction has it all - dinner, dancing, and music. Purchase tickets to one of their concerts, enjoy dinner, or just dance in the Starlight Ballroom. Night life in Westerly is all about The Knick. 21+ unless special events otherwise noted. .
. This outfit offers sport fishing charters aboard a modern boat that is piloted by an experienced captain. Napatree Point, During the Hurricane of 1938, Napatree was hit hard by the storm surge. The hurricane destroyed all homes and roadways that were on the 60 acres of land. Today the land is a great beach spot where it is a short mile walk from Watch Hill. This area is widely known for its bird watching spots and surfs spots. The land also holds, Fort Mansfield, an old navy post was only operational for a few years before it was sold to create homes in 1928. Today some of the fortified gun emplacements can be seen and structure of the buildings as well. Low tide reveals some of artifacts during that time. Pond View Racquet Club, 252 Shore Road, +1 401 322 1100, This location offers courts and facilities for tennis indoor and outdoor. Water Wizz Water Fun Park, Misquamicut Beach, Phone: +1 401 322 0520, . 10AM-6PM. Seasonal water park with water slides. $25. For 1 hour it is $11. YMCA: Ocean Community The YMCA in Westerly is essentially a brand new building. Although it has been around for over 60 years the building has just been fully renovated. The Y includes 2 swimming pools, 3 gyms, a workout center, and even two racquetball courts. The YMCA located on 95 High St.
Misquamicut Beach, . With a wide range of beach fronts to choose from, any person can find there own space in front of the ocean. Parking Monday-Friday for residents is $10 for residents and $20 for out of state visitors, while the weekends are $14 for residents and$28 for out of state visitors. Town Beach: Westerly During the summer months westerly is booming with tourists, many of them come for westerly’s famous beaches. One of the more popular beaches is Westerly’s Town Beach, it is run and operated by the town from Memorial Day to Labor Day. It includes a pavilion with a restaurant and changing rooms. It’s located on Atlantic Ave right between Jim's Trailer Park and a housing complex. It should be noted that this beach is only accessible to Westerly residents and property owners. Anya Blu, 38 High Street, +1 401 315 0700, M-F 11:00AM-6:00PM Sa 10:00AM-5:00PM Su 11:00AM-4:00PM. . A specialty boutique, Anya Blu has been voted "Best Hipster Clothing" by RI Monthly Magazine. Shop for brands that you won't find anywhere else in town. Dunns Corners Market: a locally owned business right on langworthy rd provides residents with fresh meats deli platters and sandwiches, open year round 7 days a week. Franklin Street Shopping Plaza: Located on Franklin St, this plaza includes JCPenney, FYE, Dressbarn, TJMaxx, Hallmark, Pier One and Shaws. Franklin Street Plaza is one of the more well-known shopping plazas in Westerly. Hammen Home, 14 Broad Street. . A very cute shop with unique finds such as art pieces, jewelry, and assorted bandages in a wide array of shapes (including beef and bacon). Definitely worth stopping in. Mikes Computers: locate on franklin st, mikes computers fixes restores and sells computers. They also buy any used computers or unwanted parts. Nigrelli's Jewelry, 27 High Street, +1 401 596 4421. . 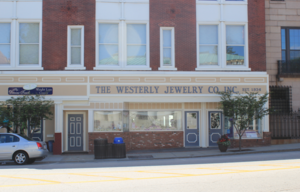 Established in 1947, Nigrelli's is a family owned and operated jewelry store. Choose from their great selection or have them make something custom for you. The service is great; everyone who works there is so friendly. Hilltop Café, (Pods), 23 Canal Street. Hands-down the best pizza you will find in Westerly. Not exactly a family-friendly atmosphere, but if pizza is what you are looking for Pod’s is head and shoulders above everywhere else. There buffalo wings are also terrific, and they have a full service bar. Also, don’t expect to be waited on hand foot; the service will leave something to be desired. Misquamicut Sandwhich Company, 57 Shore Rd. +1 401 637 4910 Mon-Fri: 9:00 am-3:00 pm, Sat & Sun: 8:00 am-3:00 pm Delicious breakfast and lunch served all day. Recommended is the turkey and bacon melt. They also offer a wide selection of grilled cheese. Oak St. B&B, 87 Oak St. , +1 401 315 2520 Monday and Wednesday 8:00 am - 3:00 pm Thurs-Sat: 8:00 am to 8:00 pm Sun: 8:00 am-1:00 pm Tues: Closed. Known for their breakfast and burgers. All their burgers are served on the best tasting bread, which is their Portugese rolls. Also served with “Oak Chips” which adds a nice taste to accompany the burger. They offer the best food for lunch, and only open for dinner on Thursday, Friday, Saturday. Catering options available for breakfast and lunch. Thur-Fri : 10:00 am-10:00 pm International Deli that is known for its Middle Eastern food selction. Selections mostly include wraps, pizza and salads. Recommended is the chicken gyro wrap- grilled chicken on pita bread stuffed with lettuce, tomato, onions and tzaziki sauce. Reale’s Groceries, 122 High Street, +1 401 322 2323. One of two old, Italian grinder places in Westerly that are highly regarded. Features soft grinder rolls and they are well known for their meatball grinders. Outside of the meatball this is not the place to go for hot grinders as it is the only one on the menu, and they do not toast their grinders. They also have hard to find Italian meats, such as prosciutto and mortadella, which they feature in their loaded Italian grinder. 4.50-8.00. Ritacco’s Market, 84 Oak Street, +1 401 596 1835. This is the second of the old Italian Westerly grinder places that have almost been around longer than cars (barely kidding). Here, they use very hard bread that they bake themselves every morning. They also sell Italian delicacies such as soupy and wandies. The hot grinders are the specialty here, they have meatball, steak and cheese, sausage and peppers amongst many, many more. They also toast every grinder unless you specify you do not want it toasted. Sandy's Fine Food Emporium, 15 Post Road (Route 1), +1 401 596 2004. . Sandy's has a wide selection of the highest quality produce and the areas largest selection of organic products. The deli prepares wonderful fresh foods daily. Sandy's also has a variety of unique sandwiches and wraps made to order: Try a "Misquamicut," (hummus, sprouts, green peppers, choice of cheese on a spinach, wheat or tomato wrap) next time you visit. Ella’s Fine Food & Drink, 2 Tower Street, (401)315-0606. French, American Asian-Fusion. $20-$30 entrees. One of the few places in Westerly to experience modern fine dining. Menu includes pork belly, rabbit, duck confit, and fois gras, all made in unique ways. The wait-staff is extremely formal, pulling out your chair, placing your napkin on your lap, etc... Both the bar and restaurant are usually crowded. Making reservations is recommended. Tuesday-Friday 4pm-10pm. Saturday 3pm-10pm. Olympia Tea Room, 74 Bay Street (Watch Hill), +1 401 348 8211, Tu-Su 11:30AM-8:00PM. . Surrounded by many shops, the ocean, and one of the oldest carousels in America, Olympia Tea Room is as beautiful as its surroundings. Closes during the winter; reopens in Spring. Primetime Café, 1 West Broad Street (Pawcatuck, CT). 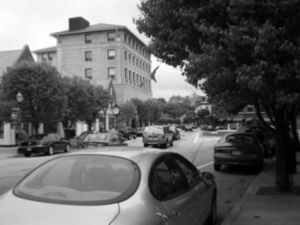 Primetime is just across the Westerly/Pawcatuck border and has large picture windows that overlook the Pawcatuck River. They serve breakfast, lunch and dinner. They serve a limited menu, if variety is what you are looking for this is not the place for you. However, the portions could feed a small army. It is almost a hole in the wall, but it is definitely worth a try if you want to get away from the beach area. Thai Pepper, 15 Railroad Avenue (directly across from the train station), +1 401 348 0511, Tu-Th 11:30AM-9:00PM, F-Sa 11:30AM-10:00PM, Su 4:30PM-9:00PM. . A small but very nice (with candle light and soft music) Thai restaurant. Try the Thai Pepper Sampler and Thai Sweet Iced tea -- they're delicious. $6.95-$16.95. Venice Restaurant, 165 Shore Road, +1 401 348 0055, Dining room and lounge open daily at 4:00PM. . Venice is a restaurant and banquet facility that is located near the beautiful scenic seaside. $16.00-$26.00. Vetrano's Restaurant, 130 F Granite Street, +1 401 348 5050, . This restaurant will please anyone who loves authentic Italian food. The unique murals on the walls provide for a real Italian experience. $10.75-$19.95. The Andrea, 89 Atlantic Ave. Open daily from 11:00am to 1:00am. Andrea Hotel and The Andrea is the same location. This restaurant/bar/hotel is located right on the Atlantic with a back deck leading onto the beach. They offer lunch and dinner menus, with a comprehensive seafood menu for those who would like to try the local fare. They offer a nice selection of coladas for those looking to cool down on a hot summer day. At night, there is usually either a DJ or a band, which are listed on their website at  Paddy’s can be found just a few doors down, also right on the beach for those that like to move around. Andrea Hotel, 88 Atlantic Av., Phone: +1 888 348 8788,closed until Spring 2013 due to Hurricane Sandy damage . Aquastar Inn at Westerly, 110 Post Road, Phone: +1 800 596 2892, . Pine Lodge Motel, 92 Old Post Rd., Phone: +1 401 322 0333. Pleasant View Inn, 65 Atlantic Av., Phone: +1 401 348 8200 or Phone: +1 800 782 3224, email [email protected] . An oceanfront hotel in Misquamicut featuring an outdoor pool and onsite restaurant. Point One Resort, 26 Winnapaug Road, Phone: +1 401 348 0320 or +1 800 557 2050. Sand Dollar Inn: located further away from all of the beach commotion, the Sand Dollar in located on 171 Post Rd. serves a small hotel for anyone passing through the area. Rooms can only be booked ahead of time by calling 401-322-2000. Narragansett is about 20 minutes north no RI 1. This page was last edited on 10 February 2017, at 21:17.